Today 7th March Barbucha gave birth to our last arrival, a girl. 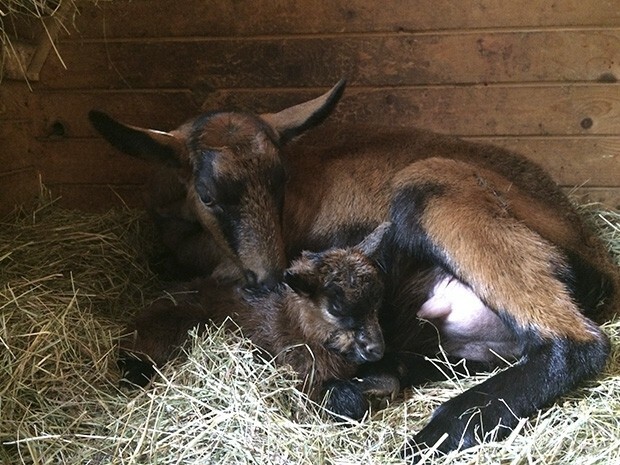 Barbucha was born in Spring 2014 and this is her first kid. It was a difficult birth during which the kid almost suffocated. When she was born, I had to clear out her muzzle and I tried to help her with breathing. I was beginning to think that she wouldn’t make it when she finally took her first deep breath. After an hour she got up on her four wobbly legs and with my help began to drink. I keep my fingers crossed that she is fine from now on. I am very pleased with Barbucha, who immediately developed a strong bond with her daughter. She never leaves her side, keeps her clean and is very patient whilst feeding. Before the birth she was quite a nervous nanny-goat but now she doesn’t mind what is happening around her, she only cares for her bellowed kid.